Behold the Pertamina Energy Tower, a U.S.-designed building that's slated for construction in Jakarta, Indonesia. Reaching a height of a half-kilometer, the tower will harvest its own wind energy through an opening at its peak. Once completed in 2020, the Skidmore, Owings & Merrill-designed building will be twice as high as Wisma 46, the tallest building currently in Indonesia. 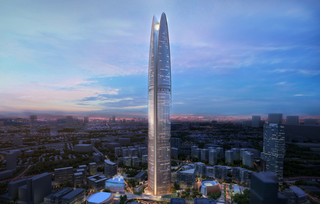 The completed tower will feature a "wind funnel" at the top that generates energy from prevailing air currents. In addition, the tower will have a shape and orientation that's perfectly calibrated to Jakarta's proximity to the equator — a curved facade that will mitigate heat gain throughout the year. The 99-story Pertamina Tower will accommodate 20,000 employees. Described as a "city within a city," the building will host a 2,000-seat auditorium, a mosque, and a central energy plant.